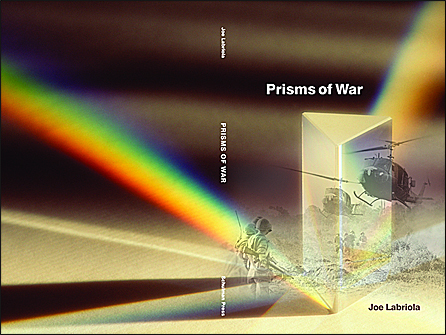 We designed both the contents and the cover for a book of poetry titled Prisms of War (ISBN 0-9740728-0-X), written by incarcerated Vietnam war veteran Joe Labriola. To show you the full impact of the cover, the layout is shown as though the book were laid flat, with both the front and back covers visible. We were able to include several special elements in the design of this powerful and moving book. In an effect which is only visible if you hold the actual book in your hands, the letters of the book’s title are not printed, but stamped with a subtle holographic / rainbow foil. We designed both the cover and the entire contents of the book, including a special dedication to Joe’s wife Lynnette Kathleen, who passed away on September 18th, 2001. The dedication is a touching tribute that involves a translucent page overlay.